Red White and Blue Cheesecake Bars are the perfect sweet treat to show off your American spirit. Creamy cheesecake with red and blue swirls, these Red White and Blue Cheesecake Bars are the perfect dessert to celebrate Fourth of July. Are you looking for a easy, quick dessert idea to appease the masses this Fourth of July? I have your solution. Red White and Blue Cheesecake Bars are the perfect sweet treat to celebrate the holiday with family and friends. I love cheesecake and it doesn’t really matter what kind it is. It doesn’t matter if it’s traditional or otherwise, if it falls under the title of ‘cheesecake’, it can be bars, parfaits, bites or entire desserts, I just really love cheesecake. As I mentioned in my Triple Chocolate Mocha Cheesecake post, I could pretty much eat cheesecake everyday if that desire was not offset by gaining 500 lb. And what’s not to love? 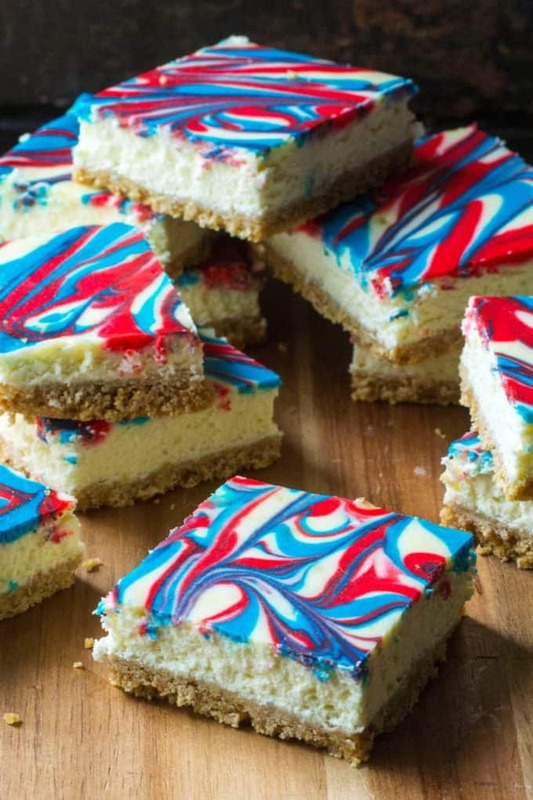 Creamy dreamy goodness floating on top of a graham cracker crust and when you start swirling in patriotic colors, well, what you have there are perfect Red White and Blue Cheesecake Bars to show off your red white and blue spirit this summer. HOW DO I KNOW MY CHEESECAKE IS DONE? When you make cheesecake, the hardest thing to know is when it is done. To check if your cheesecake is done, gently shake the cheesecake and only a small circle in the center jiggles slightly, it is done. The center will firm up as it cools and I find turning your oven off when the cooking time has completed, opening the door and letting the cheesecake sit in the open oven for about an hour creates a perfectly cooked cheesecake. WHY DO CHEESECAKES NEED A WATER BATH? Cheesecakes are often baked in water baths or with a pan of water placed in the oven while the cheesecake cooks. This method is used because the hot water steam from the water will ensure even baking and lessen the likelihood of of the cheesecake cracking on top. 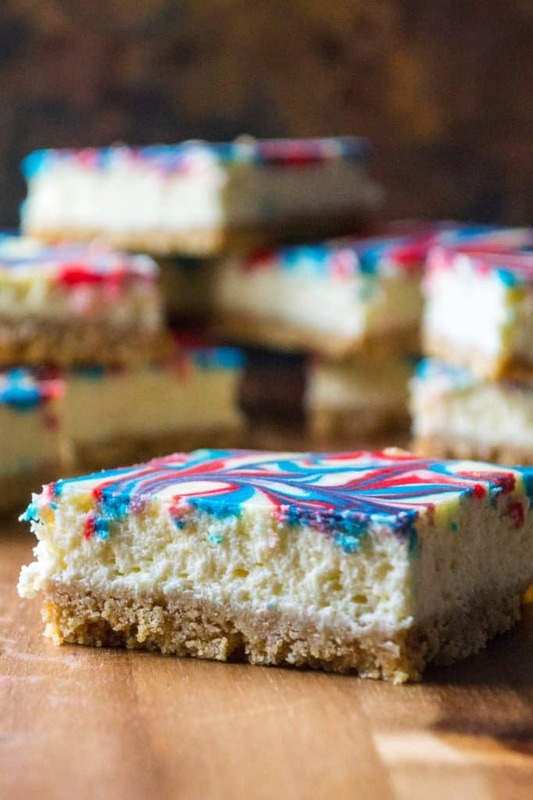 HOW DO I MAKE RED WHITE AND BLUE CHEESECAKE BARS? Easy! 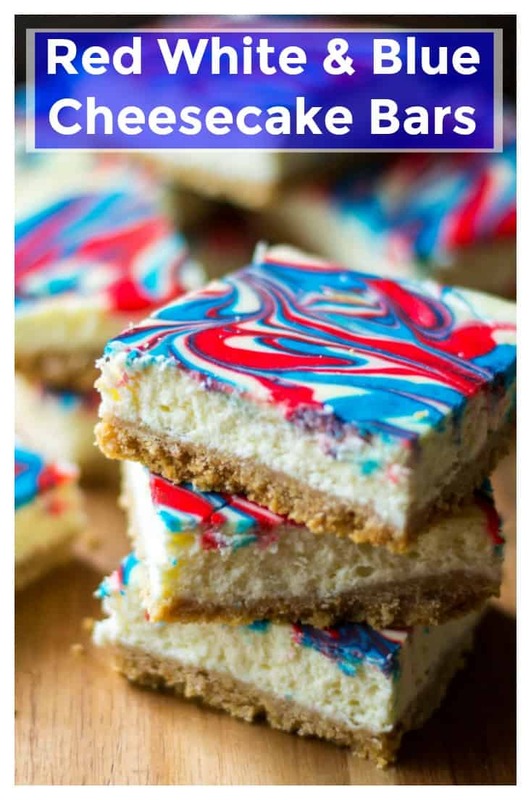 To make Red White and Blue Cheesecake Bars peheat oven to 325 degrees and place a baking pan filled with water on the bottom rack of your oven. Start by combining graham crackers, melted butter and sugar in a mixing bowl and then transferring the mixture to a 9 x 13 baking pan lined with parchment paper. Set aside. In a large mixing bowl, beat softened cream cheese until creamy and then add in sugar and salt and mix well. One by one, add in eggs and beat until each is incorporated before adding in the next one. Add in sour cream and vanilla and continue mixing until you have a creamy filling. Transfer 1 1/3 cup of cheesecake filling evenly into two separate bowls and add red food coloring to one bowl and blue to the other. Mix the food coloring in to combine. Pour the white cheesecake filling on top of graham cracker crust and smooth until even. Using a spoon, pour alternating lines of blue cheesecake filling and red cheesecake filling down length of cheesecake. Swirl the colors into cheesecake filing using the back of knife (or a chopstick!) to create a beautiful swirl pattern. The more swirls, the better..
Bake in oven for 50-55 minutes or until center is no longer wobbly. When baking time is done, turn off oven, open oven door and let your Red White and Blue Cheesecake Bars sit for one hour in the open oven. Remove from oven and refrigerate overnight before pulling up on parchment paper and removing from baking pan. Cut into squares and serve! 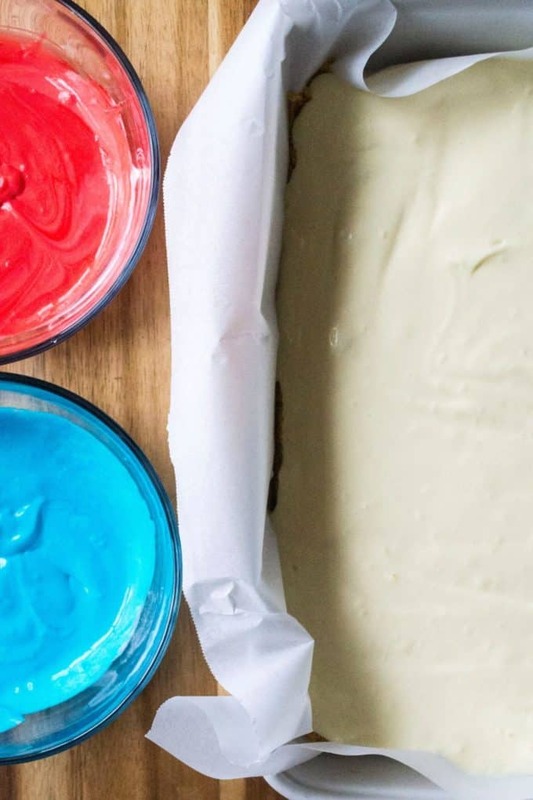 Making Red White and Blue Cheesecake Bars for parties and get-togethers has become one of my favorite things to bring because they are so easy and so quick to make that it really frees up your extra time and you are still bringing an amazing dish to your backyard barbecue. Besides, what says love more than cheesecake? Yes, a million dollars does also say love also but which are you more likely to share? 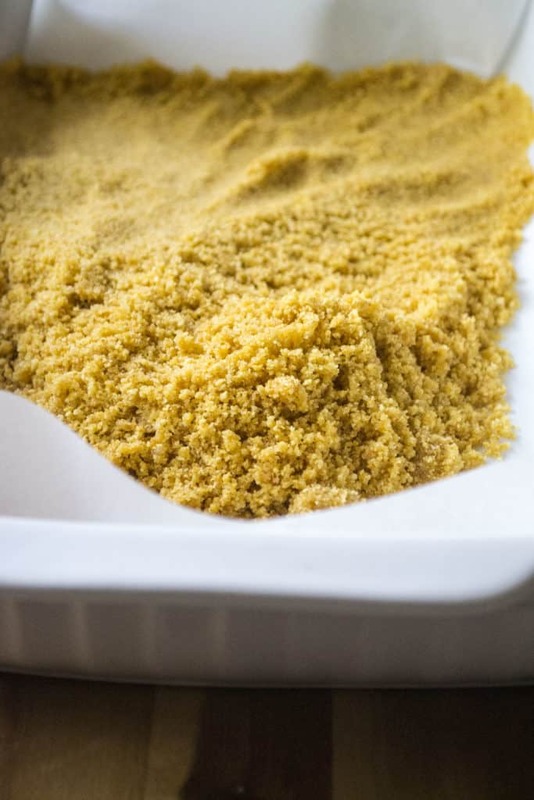 And which comes with that darn delicious graham cracker crust? So, the next time your phone rings with a party invite this summer, don’t even stress on what to bring. 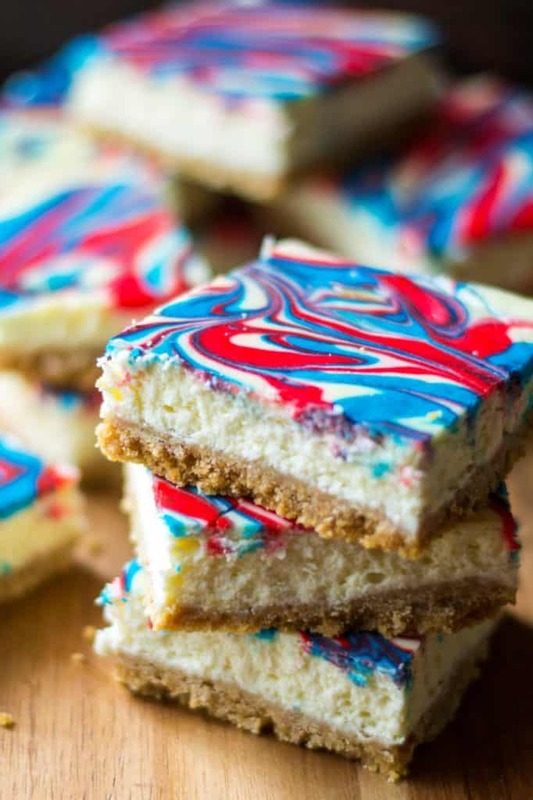 Just make these Red White and Blue Cheesecake Bars and everyone will have a great day! Looking for more cheesecake ideas? Check out my Blackberry Lemon Cheesecake Bars, Mint Chocolate Cheesecake and my White Chocolate Raspberry Cheesecake. Like I said, any way it comes, cheesecake is always a hit!! 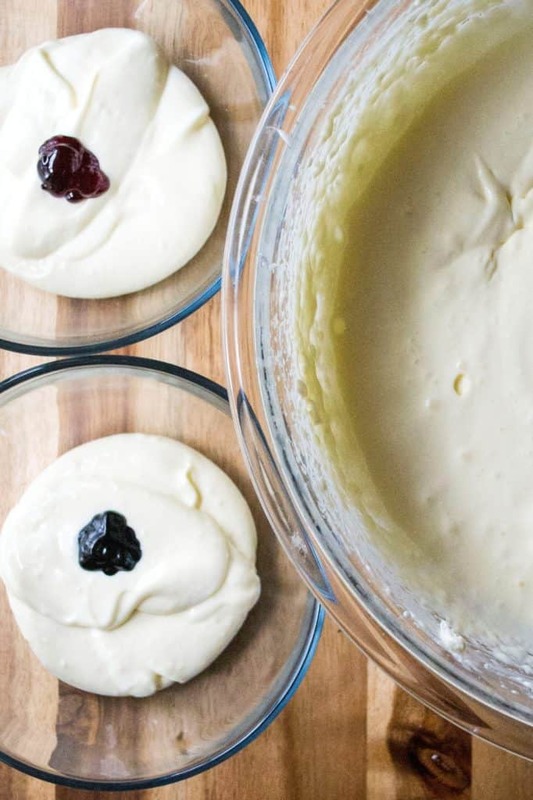 In a large mixing bowl, beat softened cream cheese until creamy and then add in sugar and salt and mix well. One by one, add in eggs and beat until each is incorporated before adding in the next one. Add in sour cream and vanilla and continue mixing until you have a creamy filling. Transfer 1 1/3 cup of cheesecake filling evenly into two separate bowls and add red food coloring to one bowl and blue to the other. Want to know a trick for lining your pan with parchment paper? Turn your empty baking pan upside down on your parchment paper and then with a knife, draw the outline of your pan but with an extra one inch border. Lift up your pan and then cut your outline out of the paper. Perfect fit every time! I just love how fun these are and always look for new ideas to make for Patriot holidays. The kids just love all the festive foods and this will be added to the list of must makes this year! THANKS! I love your take on this dessert for 4th of July. Love cheesecakes and love bars to this is definitely on my list of must make soon. Love how pretty the marbling has come out. What a great and delicious idea! I want to make these for a 4th July party at work – I bet these would be the hit of the pot luck table! I am a huge cheesecake fan and this one is absolutely beautiful. I just want to dig in. These look so COOL! 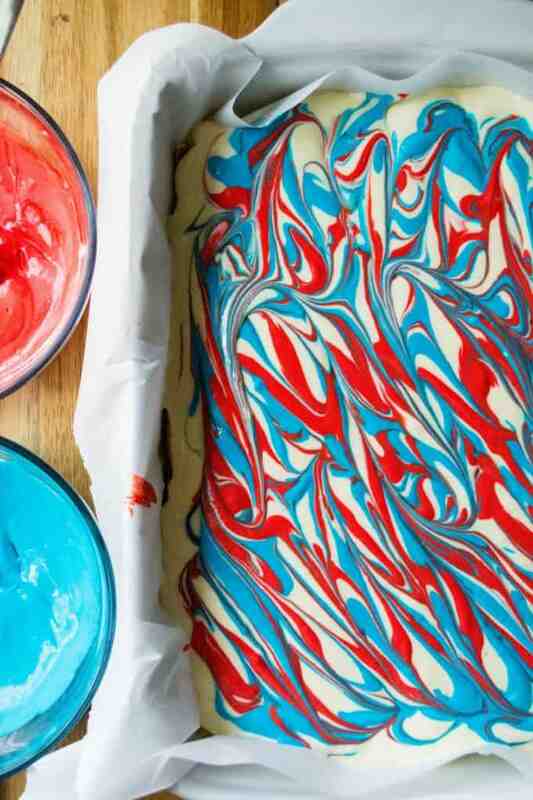 I love the effect of the colors in the icing it will surely make this standout at our large July 4th family gathering! Thanks for such a great idea! Wow! These are beautiful! I am saving this one for the 4th of July party we host every year. I am pretty sure these will disappear as quickly as I set them down! That looks fab! Love the beautiful marble effect of the colors! Looks like a fun recipe to make! Great looking dessert. I love the red white and blue and it would be an ideal dessert either during Memorial Day or Independence Day. Can’t wait to make it. These are perfect for 4th of July! I’ll be adding them to my dessert table this year!